The Turkish central bank has been burning through its foreign reserve holdings to the tune of $10 billion in an attempt to support the price and dollar-based peg of its national fiat currency the lira. Yesterday, the national currency plummeted 5% against the USD, dropping from 5.3 all the way back down to 5.6 Turkish lira (TL) per US dollar. The Turkish central bank’s net international reserves for the week ending March 22 sat at 142 billion lira ($24.7 billion), showing a near $10 billion drop in the first three weeks of March. 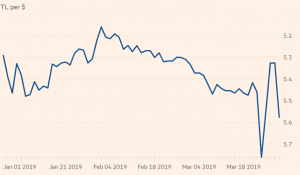 The latest currency sell-off has added to deepening turmoil in the Turkish financial markets, which have been in flux for almost a week in an uncomfortable echo of last summer’s crisis that sent the lira tumbling to record lows, with lasting effects on the economy. The currency plunged by around 30% in 2018 in what was a turbulent year for the country. The fresh turmoil comes off the back of a recent collapse in the lira’s overnight swap rate, which surged more than 40-fold over the first three days of the week to the highest level since Turkey’s 2001 financial crisis. The swap rate experienced a 1000% move at one point on Wednesday. Bloomberg has reported that “funds abroad trying to close existing lira positions are failing to find counterparties and, subsequently, driving up the rates”. The moves this week have raised uncomfortable questions about Turkey’s balance of payments and its ability to roll over foreign loans, or how and from whom it would seek emergency reserves if necessary. With local elections on the horizon this upcoming weekend, it looks like the volatility may continue for the lira over the next few days at least. Turkey is currently ranked 34th in the world in terms of its stock of narrow money, valued at $122 billion at the end of 2017 by the CIA. If the Middle Eastern nation wants to keep its dominant status, then it will need to work out pretty quickly how it can maintain the lira’s fiat peg without burning through its foreign reserves at a rate close to $500 million a day.